El Paso, Texas, has begun its community outreach phase for its updated bike plan. A weekend festival allowed citizens their first opportunity to add input. El Paso, Texas, city officials are in the planning stages of updating their 33-year-old bike plan to offer residents more innovative bike facilities, enhance connectivity for cyclists through the city and decrease traffic on the city’s roadways. 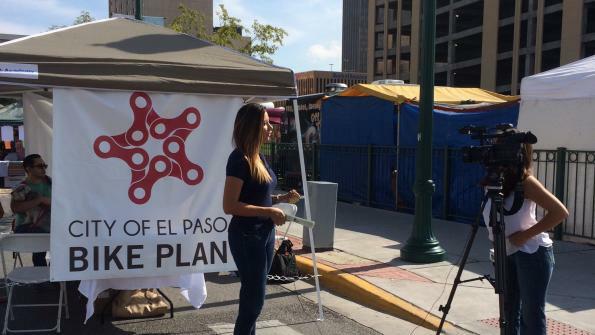 El Pasoans had their first opportunity to offer input on what the bike plan should include during Saturday’s Bike Plan Community Outreach Kick-Off as a part of the Chalk the Block festival in downtown El Paso. More than 40,000 citizens the three-day long festival, where bike plan consultants were on hand with bikeway treatments and sample bike plan facility markings that were chalked along the street to display potentially how the bike lanes would be designated, according to Martin Bartlett, a City of El Paso spokesperson. “As our city grows and as we turn our focus toward quality of life, a more bicycle-friendly and sustainable city can mean reduced emissions from vehicles, reduced traffic congestion and safer, more attractive roads to walk and bike along,” Justin Bass, Project Manager for the City of El Paso, said in a written statement. Over the next few months, the city will offer open houses and community meetings across the city to share updates and procure further input for the comprehensive bike plan. Alta Planning + Design, a nationally-recognized transportation design firm, will help the city develop the bike plan. While city officials are developing the bike plan, El Paso Metropolitan Planning Organization will work alongside the city cultivating a multi-modal plan to identify gaps in the existing network of transportation for bicycles, pedestrians and transit. Statewide, efforts are underway to prioritize the conceptual design and costs for El Paso’s state-owned roadways by the Texas Department of Transportation. To learn more about the city’s bike plan, visit the website or text ELPASOCIP to 22828.